You, Me and Movies: A Second "Hobbit: The Desolation of Smaug" trailer raises questions. 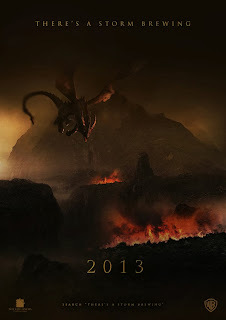 A Second "Hobbit: The Desolation of Smaug" trailer raises questions. As of tonight, I have seen the two latest trailers for "The Hobbit: The Desolation of Smaug" and I am sure New Line and Warner Brothers have another sure-fire hit that will make money. However, will the movie itself be good? I'm not sure. I have had a rough time personally wrapping my head around a three-part Hobbit franchise. I thought the first film was good, but I don't know if this story really needs three 2 hour plus movies. First of all, the story was not long enough to need three movies of that length. Jackson, New Line and Warner Brothers could have easily made "The Hobbit" in one sitting. I even felt their proposed 2 film treatment would have been fine too. But three films? I understand that Jackson wanted to add lots of footage based upon Tolken's appendices, but is that really needed? I feel, based upon this second trailer that it is overkill. I mean does Legolas really need to be in it? And does he really need a love story? I understand why people fell in love with the character in the early 2000's. Orlando Bloom is talented actor who is eye candy for women. I remember so many girls my age drooling over him throughout the entire trilogy. He also happened to have one of the best characters to play in the entire trilogy and he rocked. The character was in "Lord of the Rings" books, but the character didn't appear in "The Hobbit," book so whats the point? Will this love story become a major arc for the last two Hobbit movies, and if so why? "The Hobbit" as a book was never more epic than "Lord of the Rings," for good reason. The stakes for the characters are not nearly as high in "The Hobbit" compared to "Lord of the Rings." "Lord of the Rings" is suppose to be epic, and I think Jackson captured that very well. However, it seems like he is trying to outdo his original trilogy and that rings wrong with me. Anywho, the trailer is below, and it definitely feels epic. But will that epicness overpower what makes "The Hobbit" great on its own terms? I suppose we'll find out in December.